Let’s face it: sometimes, it’s best to simply be nostalgic about times long past, rather than attempt to actually bring them back. In some ways, everyday life really is better now than it was a few decades or even a generation or two ago. That’s not the case all of the time, though. Certain old things genuinely were the good things, and communication is a case in point. Yes, an email may be efficient, but it’s hardly got soul. 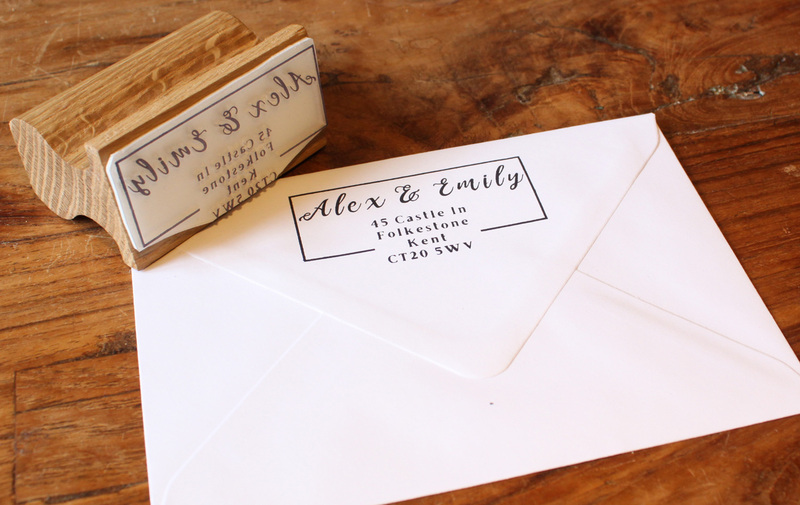 It’s no surprise, then, that so many people are now taking up the lost art of letter writing once again – or at least seeking to give their wedding invitations a little more grace and charm than a Facebook update or tweet could ever muster. Well, we think we can help you a little bit with that here at Get Stamped. Take a look through our current selection of designs for personalised address stamps online, and you’ll see just how many inspiring, intriguing and stylish ways there are to communicate your address on the back on an envelope. Who’d have thought it? Well, the Get Stamped team thought of it, that’s who! It’s why you can select from wide-ranging and charming curve, box, centre aligned, right aligned, pattern, calligraphy, floral and simple designs. But there’s more to it than that, as we also take great care with the process of making our handmade stamps, in accordance with your specific needs. Yes, these really are the most beautiful personalised address stamps, crafted from robust, long-lasting and environmentally sourced oak. Start producing incredible stamping results in no time! As you can see if you cast your eye around our wider site, we care greatly about style and quality in everything that we do here at Get Stamped. When you order your personalised address stamps from us, you won’t be getting the kind of bog-standard thing that you could have bought from an office supply store. It is within our online store that you’ll also find all of the accessories and extras that you could conceivably require to get the most out of your lovely new stamp. Oh, and you can expect your handmade product to be delivered to you within about five to seven working days of making the purchase. In short, we do things the traditional way here at Get Stamped, but with no shortage of 21st-century innovation, quality and style. There’s just no need for you to look anywhere else for address stamps!